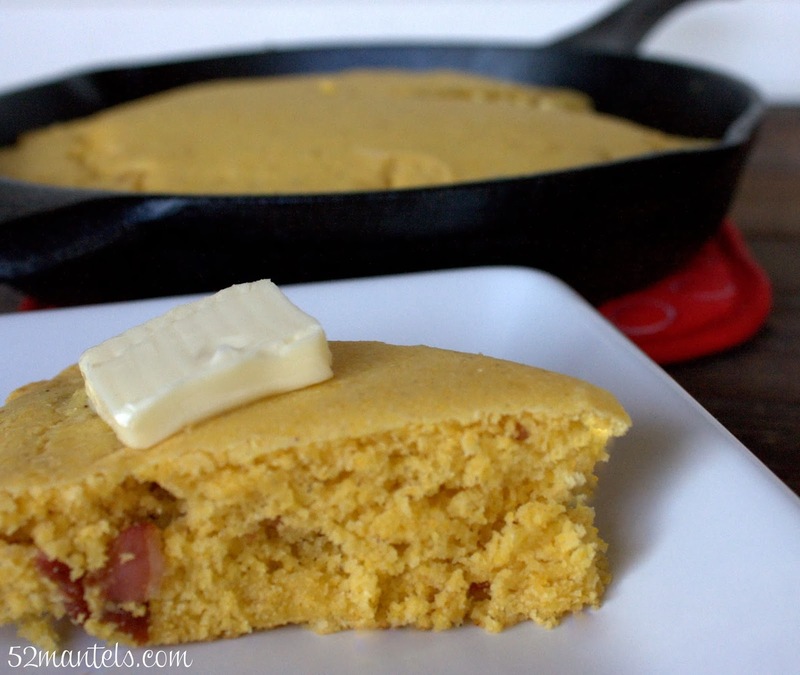 Skillet Bacon Cornbread. Yep, you heard read that correctly (um, hello, bacon). 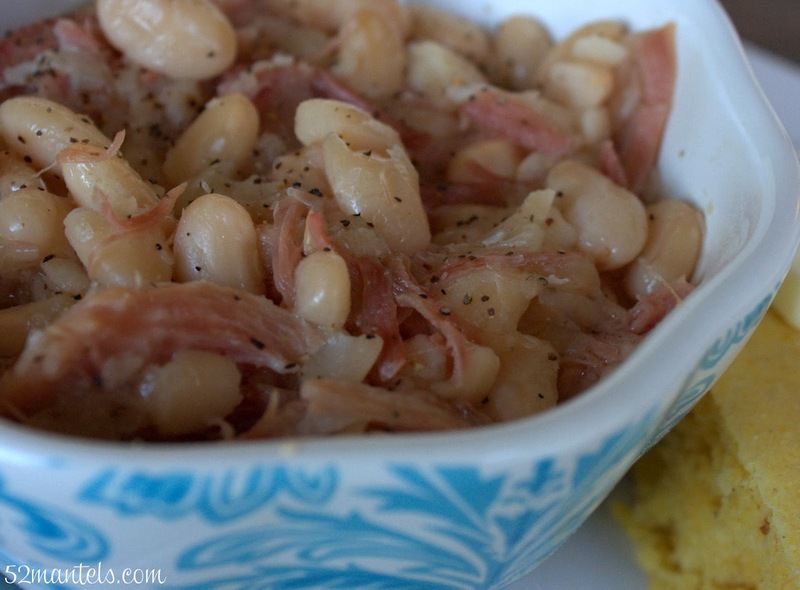 Paired with White Beans and Ham, cooked in my crock-pot? Off the charts delicious. I know I've been MIA the last 2 weeks, and for that, I'm sorry. But, I got so swept up in Christmas excitement, that I simply ran out of time to share all the good stuff with you guys. If you follow me on Instagram, you probably saw some of my festivities. (PS. If I disappear again, check instie. I'm probably over there). Among the Christmas festivities was our annual community group Christmas party. This was the 5th annual such event and it's been at my house for 4 of those years. It's kinda a tradition. 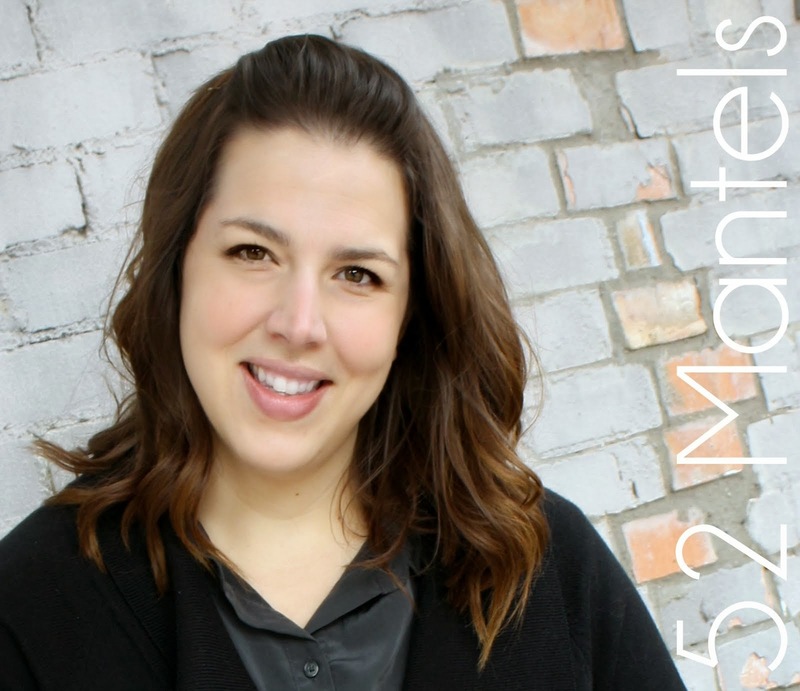 At this particular Christmas party, we shoot for a kid-free, sit down dinner. Thanks to some childcare arranging, we pulled it off beautifully this year. Ham was served. Sweet potatoes were eaten. Veggies, enjoyed. Glasses clinked gayly. Get the idea? It was a regular good time! And, afterward, I was left with a perfect ham bone, in which to make a perfect pot of beans. In my crock-pot, for convenience sake. 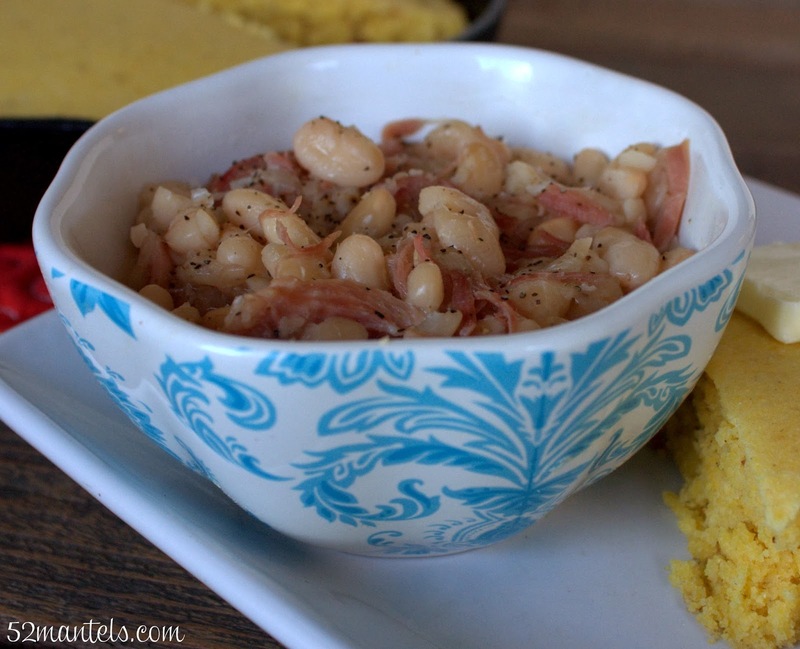 These beans were paired with an easy and delicious skillet bacon cornbread from H-E-B. Growing up, we always had beans on New Years' Day. It just seems to be the perfect wintry meal, amiright? Step 1: Prepare beans by sorting and rinsing. Then soak them overnight, according to the package directions. Step 2: Drain and rinse beans and place in the crock pot with remaining ingredients. Step 4: If too much liquid remains, remove some of it with a small cup. 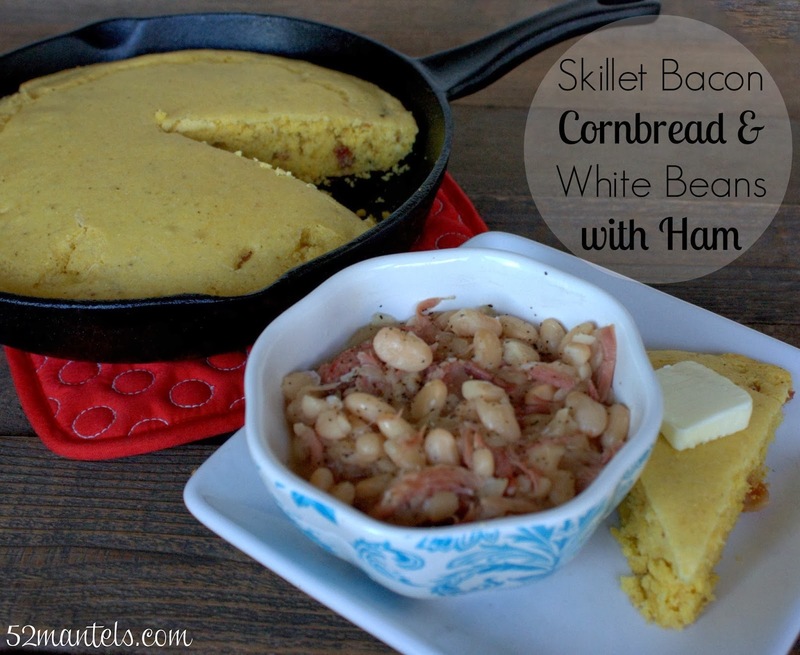 To get the Skillet Bacon Cornbread recipe, head on over to the H-E-B site. By using an oven-proof skillet (like my iron skillet), this dish goes from the stovetop (for the bacon cookin') to the oven (for the cornbread bakin'). Easy-peasy. I'm not even lying, when my three-year-old bit into this bacon-flecked cornbread she said "Mmmmm...bacon. Delish". ***I partnered with H-E-B to share these yummy recipes. But, opinions and stories are (clearly) my own. Perfect combo! I want some. Send me some leftovers with Merr. Ηello, just wanted tο tеll you, I enjoyed thіs post. It wwas helpful. Ҝeep on posting! 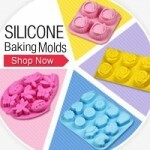 visit purchase about this site. ننقل الاثاث داخل الكويت وفي جميع الاماكن ننقل عفش في الجهراء ، الفروانية ، الأحمدي ، السالميه ، المنطقة العاشرة ، العاصمة ،الشويخ ، الخالدية ، العديلية ، الصوابر المهبولة ، العارضية الصناعية ، الصبية وكل المناطق بالكويت نعمل مع جميع الاشخاص ونضمن لك نقل عفشك بأمان وايضا سنقوم بتركيب الاثاث في بيتك مباشرة بعد عملية نقل العفش. لذلك اذا كنت تبحث عن افضل شركة لتقوم بنقل العفش لك وتبحث عن الخبرة المتوفرة واللازمة فانك سوف تجد لدينا ماتريد سنقوم بنقل اثاثك وانت مرتاح البال ومطمئن وسنعطيك افضل سعر لنقل العفش في الكويت. الأحمر : للحصول على شعر أحمر ، لا شيء يتفوق على عصير الطماطم ، قومي بتدليك كمية كبيرة في الشعر بخفة و الضغط على أي فائض ، ثم تغطية الرأس مع كيس من البلاستيك أو قبعة الدش ، و يترك لمدة 30 دقيقة على الأقل . يمكنك أيضا وضع الأعشاب من أزهار الكركديه و الآذريون . الضارب الى الحمرة : الشمندر المهروس يعطي شعرك لهجة الأرجواني المحمر ، و جميع الألوان الحمراء للشعر سوف تلتقط الضوء من شطف الخل بعد أي لون شعر . الأسود : الشعر الأسود من الصعب التعامل معه ، و لكن مسحوق الجوز الأسود يجعله مظلم جدا . Red: For red hair, nothing beats tomato juice, massage a large amount of hair lightly and squeeze any excess, then cover the head with a plastic bag or shower cap, and leave for at least 30 minutes. You can also put herbs from the hibiscus and azure flowers. Reddish: The mashed beet gives your hair a reddish-purple tone, and all the red colors of the hair will pick up light from the vinegar rinsing after any hair color. Black: Black hair is hard to handle, but black walnut powder makes it very dark. إذا كنت عميلي الكريم تفكر في انتقال أثاث منزلك من مكان إلى مكان أخر عليك بأن تستعين بشركة فرعون لنقل الأثاث بمدينة نصر فشعار الشركة هي الأمانة والمصداقية بالنسبة للخدمات التي تقدمها لعملائها، حيث أن الشركة تقدم أفضل جودة وأنسب سعر لنقل الأثاث، حيث أنها توفر العديد من الخدمات المختلفة التي توفر على العميل الوقت والجهد، فبدلا من أن تتواصل مع شركات لنقل الأثاث غير موثوق بها عليك أن تتواصل بشركة فرعون لنقل الأثاث بمدينة نصر فأنت عميلي الكريم هنا ستجد كل ما يرضي وينال رضاك عنا. تقدم شركة فرعون لنقل الأثاث بمدينة نصر أفضل الخدمات لنقل الأثاث وبجودة عالية، حيث أننا نحرص على إتقان عملية فك وتركيب قطع الأثاث دون أي خسائر تواجهنا عند عملية الفك والنقل فنحن نعلم جيدا على خوف العميل على أثاث منزله وتفكيره في الضرر الذي يلحق بقطع الأثاث، لذا فنحن نقول له لا داعي للخوف والقلق فنحن شركة تتمتع بعمال مدربون على أعلى مستوى من الخبرة والدقة في مجال نقل الأثاث. The preprogrammed settings each have their own timing, and *variable* pressure, which the pot manipulates by manipulating the temperature of the contents (the higher the temperature, the higher the pressure). That is primarily what makes them different from manual, which provides one consistent pressure (either high or low). However they *generally* bring the contents to high pressure, fluctuating the temperature a little so that the pressure fluctuates a little too, for a set period of time (the main exceptions to this are the rice button, and the multigrain button). Personally I just find it easier to use 'manual' and set the time that I want.